The Profoot Soft Gel Bunion Sleeve is part of the Profoot range of footcare solutions. Instant relief from painful bunions! The Gel Bunion Sleeve uses cutting edge polymer gel technology, which offers fast relief from painful bunions. By reducing virtually all pressure and friction to the area, the Bunion Sleeve helps to keep you pain free all day. Directions: Slip sleeve over the foot, and feed the big toe through hole as shown on front of pack. Washing Instructions: Carefully wash with warm water and mild soap. Air dry only. 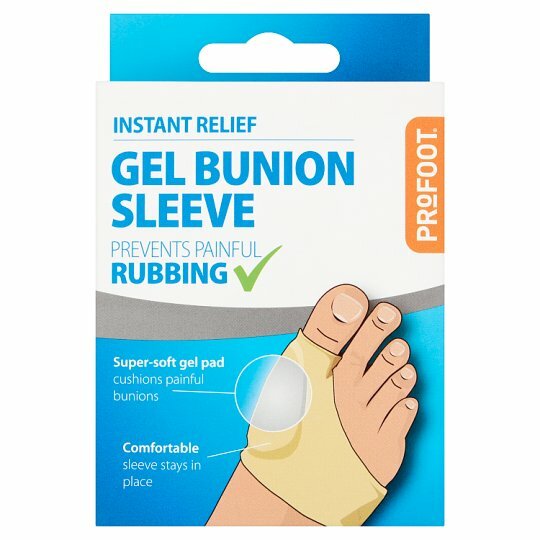 Profoot Gel Bunion Sleeves are guaranteed. If you are not satisfied for any reason, return them with your receipt, within 30 days of purchase for a full refund.